Skinny Fiber Guarantee - Nothing To Lose But Weight! A lot of people ask me to send samples of Skinny Fiber. They think that trying Skinny Fiber for a few days will let them see how the product works for their body and this is not true. As much as I love to accommodate customer requests, unfortunately, I cannot help with samples. In fact, No distributor is allowed to give Skinny Fiber samples. First of all, it is against company policy. The company provides a full guarantee instead. Secondly, samples are just no good. This is because a couple of days of Skinny Fiber is not long enough for you to see how the product really works. The average body cleanse is from 7 days to 42 days and Skinny Fiber results are dependent on the individual's body. Skinny Fiber helps with cleansing, appetite control, fat blocking, natural energy and what the enzymes can do for your body. 30 days gives a great start and doing the 90 day challenge is the perfect amount of time to invest in weight loss with Skinny Fiber. Samples just do not provide enough time for your body to experience the benefits of the product. If I were you, I would be very skeptical if someone offered samples of Skinny Fiber (especially on Ebay or Amazon). It is likely that the product is not authentic / real Skinny Fiber if the person is giving out samples. Keep that in mind! The company has always had a 30 Day Empty Bottle Money Back Guarantee, but last month announced that Skinny Fiber would have a 90 day guarantee available instead "for a limited time". Since the weight loss challenge is for 3 months this 90 day money back guarantee helps customers dedicate the full time to the program. As you can see from the testimonials on the Facebook page, so many people experience incredible results during that time frame. 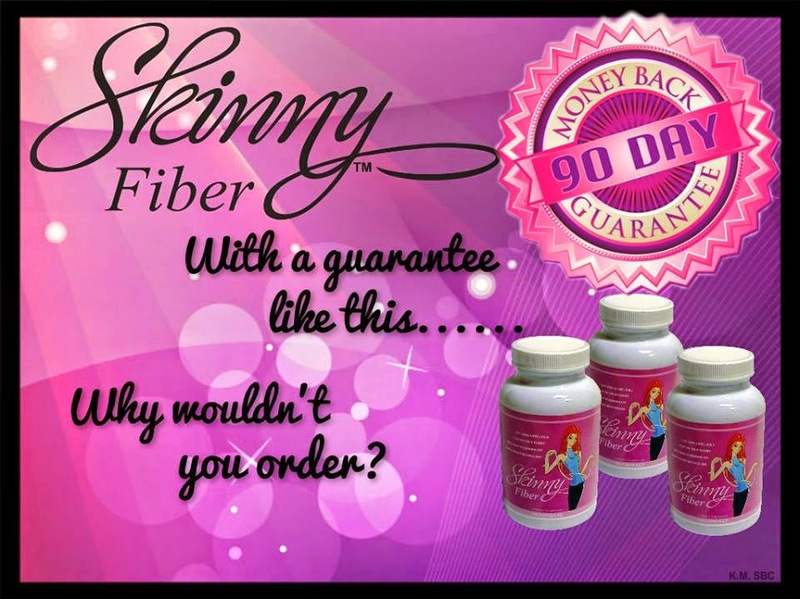 How Does the Skinny Fiber Guarantee Work? If you start your 90 day challenge with either the Buy 2 Get 1 Free or Buy 3 Get 3 Free package, then you qualify for the Skinny Fiber 90 Day Guarantee. All you have to do take the Skinny Fiber (or any of the products) as suggested by your distributor / company website, drink your water and follow the information in your free tracking website ... Your Skinny Fiber is guaranteed. The program is for you to give your weight loss 100% effort during that time and without the stress of trying to drop all of the weight in just 30 days when you need the time to adjust, remain consistent and achieve results. If you are not satisfied, contact the company for information on how to return your empty bottles / packages, and they will help you. *** NOTE - This is only for the products offered by and sold by the Skinny Body Care corporate websites (not Amazon or any other 3rd party website. Please keep this in mind! How Do I Take Skinny Fiber / How Does The Challenge Work? Take 2 capsules twice a day at least 30 minutes before your 2 largest meals of the day and with 8 to 16 ounces of water. Some people take Skinny Fiber 3 times a day and that is ok, too. Make sure to drink at least 1/2 your weight in ounces of water as health professionals recommend. Water is extremely important for your health and weight loss; the glucomannan in Skinny Fiber uses water, too. The goal is for you to also start making the healthy lifestyle changes you need to lose the weight once and for all. The company gives you a free tracking website where you login to your account and privately monitor your success. There is also a health guide, fitness tips and information on how you can connect with your distributor, support group and company. This way you have all the support you need while doing the 90 day weight loss challenge. If you have further weight loss goals after the initial 90 day, you can do another challenge. There is no limit to how much you can lose, no shakes or fake food to buy, and no one will bombard you with support. It is there is you need / want it even if just to follow along in your support group for recipes, health tips and encouragement. The Skinny Fiber program not only gives you a quality, all natural, weight loss product, but also health information, support system and TIME to give the product to work in your body. With just a 2% return rate on the product in all of these years, it is certain that customers love Skinny Fiber. The 90 DAY GUARANTEE is just in case the product is not for you! In this sense it is so much better than getting a few samples where you don't get the time and full experience of the product; you might miss out on how beneficial it can be for your weight loss. Ready To Give Skinny Fiber A Try? JUST WANT THE SKINNY FIBER? ORDER HERE! Have questions? Please leave it in the Comment section below or Contact me directly!